Affidea, Europe's leading diagnostic imaging provider, is investing in Ireland and today officially opened its first ExpressCare clinic in the Elysian building in Cork City to serve the people of Cork and surrounding areas. 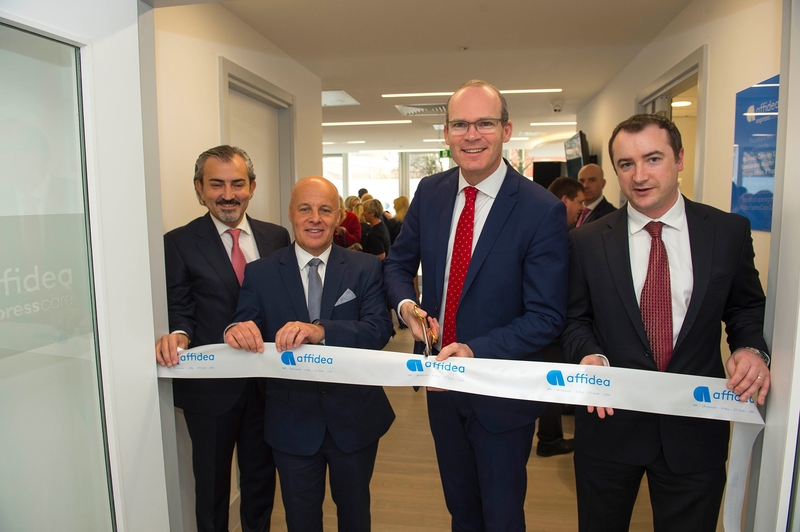 An Tánaiste and Minister for Foreign Affairs and Trade Mr Simon Coveney TD, attended the opening of Affidea’s new state-of-the-art clinic. Affidea's new ExpressCare clinic in Cork will provide high quality treatment for patients with minor injuries and illnesses, offering an alternative to a traditional, highly pressurized hospital setting. The ExpressCare facility provides access to outstanding healthcare, without an appointment, from 10am to 10pm, 365 days per year. Affidea ExpressCare is committed to providing an efficient and effective service, including seeing patients within a one-hour turnaround time. Richard Smith, Chairman of Affidea Board, said: "The opening of ExpressCare in Ireland is another milestone in the growth of Affidea's network. Affidea is committed to the expansion of our high-quality outpatient services, and in the last year alone has added 67 new centres to its network across Europe. Our promise is affordable and excellent care with proven medical outcomes delivered using the best digital and medical technologies. Affidea's clinical excellence has contributed to us receiving many international awards from across the medical and academic communities and has made us a preferred provider for private health insurers. We offer an enhanced service to our patients, playing our part in creating a healthier society, and we are proud to be here today opening ExpressCare in Cork". An Tánaiste and Minister for Foreign Affairs and Trade Mr Simon Coveney TD, said: "I welcome the opening of the first Affidea ExpressCare clinic in Ireland and believe this will be of significant benefit to the people of Cork offering high quality care for the treatment of minor injuries and illnesses. The opening of this new clinic will have a positive impact on the overcrowding being experienced in Emergency Departments in Cork City and I very much welcome this initiative." Barry Downes, Country Manager, Affidea Ireland, said: "I'm delighted that the An Tanaiste opened Affidea’s new ExpressCare clinic in Cork today. Patients can now receive attention quickly, professionally and to the highest of standards in an outpatient environment, rather than a hospital-based setting. Affidea ExpressCare also provides immediate access to our suite of diagnostic services for our patients should they require them – a unique benefit. We are very proud to deliver the highest quality medical services from our staff in a timely and stress-free manner for our patients." Affidea ExpressCare will operate independently, providing services to all patients who attend on a fee for service basis. Health insurance providers Laya Healthcare and Irish Life Health have confirmed Affidea ExpressCare is a covered benefit. ExpressCare is part of Affidea’s outpatient strategy which is to provide outstanding patient alternatives for minor injuries and minor illnesses, which should not need to take place in a traditional hospital setting. Affidea ExpressCare will provide patients with an alternative to busy Emergency Departments, combined with the added benefit of the full suite of Affidea diagnostic medical imaging, all within the same clinic. This will significantly benefit the health system in Cork, freeing up capacity for those most in need of hospital care. Affidea (www.affidea.com) is the leading Pan-European provider of diagnostic imaging and outpatient care services, with 235 centres operating in 16 countries across Europe, with a focus on delivering timely, thorough diagnoses and high quality treatments by working only with state-of-the-art technology and the best medical professionals. The Affidea Group works with 7700 professionals and operates over 1200 diagnosis and cancer care equipment with more than 10 million diagnostic examinations every year.